EV debate: Bit players or mainstream? 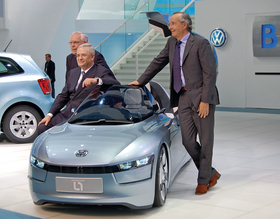 From left: Volkswagen product chief Ulrich Hackenberg, CEO Martin Winterkorn and design head Walter de' Silva show the L1 concept, a tiny diesel-electric technology showcase. FRANKFURT -- Wandering around the Frankfurt auto show, you might think the electric era of the automobile is at hand. Virtually every automaker is displaying an electric vehicle or plug-in hybrid. But behind the enthusiasm for green vehicles lies a sharp split in executives' views of the potential of EVs. Some say EVs will be high-volume second cars for busy families. Others say they will be pricey niche players with limited utility. On one side are conservatives such as Ulrich Hackenberg, Volkswagen AG's board member for product development. At a press event here last week to introduce VW's E-Up! concept EV, Hackenberg said zero-emissions vehicles will be important. But, he said, getting significant market share for EVs "is going to be an engineering marathon. It's not going to be a sprint." Electric powertrains, Hackenberg said, will be "a supplement" to internal combustion engines in the next decade. He predicted that by 2020 EVs will have a global share of 1.5 percent to 2 percent. On the other end of the spectrum is Elon Musk, CEO of Tesla Motors Inc., an upstart EV manufacturer in California. "A majority of new cars manufactured will be electric in 20 years," Musk says. "It will take much longer for the fleet to be replaced." 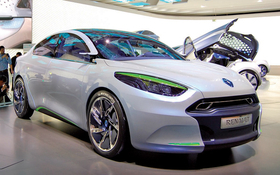 The Fluence ZE Concept previews Renault's first passenger electric, due in 2011. But it's not just small entrepreneurial companies that predict a major realignment. Carlos Ghosn, CEO of Renault and Nissan, is the industry's biggest EV believer. Ghosn says EVs could have 10 percent of the global market by 2020. He is driving Renault and Nissan full speed into EVs. Last month Nissan unveiled the Leaf EV, which is scheduled to go on sale in the Europe, Japan and the United States late next year. And last week in Frankfurt, Renault showed four EVs. The Leaf, powered by lithium ion batteries, can travel about 100 miles (about 160km) on one charge, Nissan says. Nissan has not announced prices, but the Leaf is expected to sell for $20,000 to $30,000. Meanwhile, Mitsubishi has begun selling the i-MiEV in Japan to fleet customers. In the company's next fiscal year beginning in April 2010, it predicts sales of 4,000 units in total for Japan, the United States and Europe. Renault rivals Peugeot and Citroen each will start selling a version of the i-MiEV in Europe in late 2010. The aim is to have combined sales of 25,000 unit by 2013, Peugeot bossJean-Marc Gales said. To overcome worries about EVs' limited range, Renault and Nissan are teaming up with Better Place, founded by Silicon Valley entrepreneur Shai Agassi, to set up recharging and battery-swap networks in Denmark and Israel. The companies say they will have 100,000 EVs on the roads of the two nations by 2016. But Ghosn's aggressive plan has drawn criticism. Tim Urquhart, an auto analyst at IHS Global Insight, said in a research note last week that Ghosn "is basically betting the future of the company on its bold electric passenger-car strategy." Urquhart said "pure electric vehicles are always going to have a limited potential audience until there is a major step change in battery technology which allows extended-range EVs." But Sidney Goodman, Better Place's vice president for automotive alliances, says the Israel and Denmark projects will show how a network of charging stations and battery-swapping centers can overcome those problems. In Israel, he says, the network will include tens of thousands of charging sites but only 70 swapping stations. Goodman says the profusion of concept EVs at recent auto shows reflects increased consumer interest. Mainstream acceptance of EVs is going to happen, he says. "It's not if, it's when. And it's not 2030. It's not 2020." Douglas A. Bolduc and Luca Ciferri contributed to this report. VW considers bringing electric vehicle to U.S.